We all seek comfort when it comes to dressing up, and this combination of a grey knit open cardigan and black leather leggings is a practical example of that. To add oomph to your outfit, round off with black leather lace-up ankle boots. If you're on the lookout for a casual yet totally chic look, pair a navy coat with Kimora Lee Simmons zip front leggings. Both items are totally comfy and will look fabulous paired together. When it comes to footwear, this look is finished off nicely with white and red and navy suede wedge sneakers. Consider pairing a light blue denim shirt with Kimora Lee Simmons zip front leggings for a relaxed take on day-to-day wear. Kick up the cool of your outfit by completing it with olive suede ankle boots. 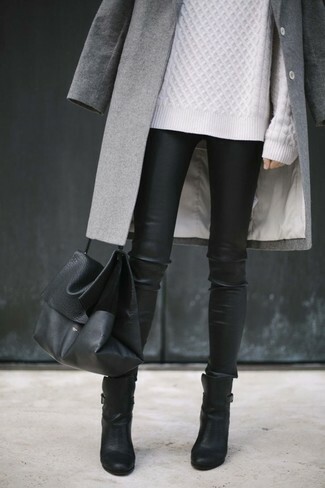 This combo of a grey coat and Kimora Lee Simmons zip front leggings epitomizes comfort and style. Bring instant interest and excitement to your outfit with black leather ankle boots. If you're all about practicality dressing when it comes to your personal style, you'll love this extra adorable combination of a black studded leather biker jacket and Kimora Lee Simmons zip front leggings. You could perhaps get a little creative when it comes to footwear and elevate your look with black studded leather pumps. Go for a white cable sweater and black leather leggings for a lazy day look. Amp up the cool of your look by wearing black suede over the knee boots. Pair a grey long sleeve t-shirt with Kimora Lee Simmons zip front leggings from farfetch.com if you're on a mission for an outfit idea for when you want to look casually cool. Wearing a pair of black suede ankle boots is a simple way to add some flair to your outfit. If you're a fan of comfort dressing when it comes to your personal style, you'll love this extra cute pairing of a grey oversized sweater and black leather leggings. Bring instant glamour to your outfit with black leather chelsea boots. 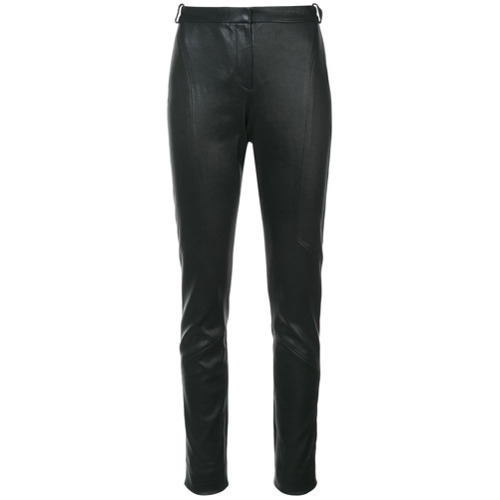 If you're on the hunt for a casual yet absolutely chic getup, wear a black long sleeve blouse with black leather leggings. Both garments are totally comfy and will look fabulous paired together.